Cricket Australia entered the world of digital media provision by developing smartphone, tablet and PC services, including the Cricket Australia Live: The Official App. 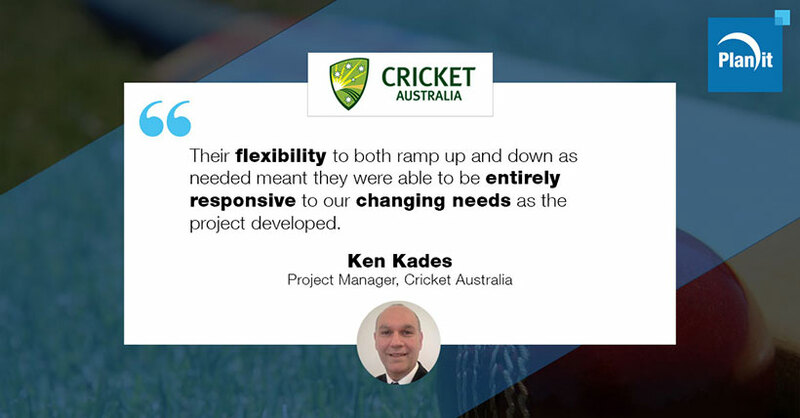 Working with Planit, Cricket Australia successfully delivered these digital platforms, establishing must-visit digital channels filled with exclusive content, including live streaming of every international and domestic match, scores, stats, news, video, audio and radio broadcasts. “Selecting the best-fit people and organisations is essential to ensure success. Making the right decisions is imperative for me in the role of the Project Manager, since I am accountable and responsible for delivery. “One critical aspect of developing an app, especially with a limited time frame such as three months, is ensuring a best practice testing strategy is in place. We needed strategic testing partners who had both the breadth of skill and resources to come with us on this critical application development journey and beyond. “We engaged Planit based on the expertise of the directors, their straight and honest approach, and extensive capability and capacity. Planit maintains many hundreds of test professionals across all the disciplines, with a one-stop-shop testing solution that provides expert advice and fully-managed services, including performance testing via the Planit Cloud. “They had a test team of industry-certified, pure testing professionals on the ground ready to go within a day. Their flexibility to both ramp up and down as needed meant they were able to be entirely responsive to our changing needs as the project developed. “The team was dedicated, passionate, and diligent in their approach, as well as receptive to learning and unwavering in their responsiveness. Working into the early hours during pressured situations, and responding to needs as they arose, is responsiveness in action. “At the conclusion of the project, over 1,500 test cases were written and executed by Planit, ensuring the project was an overwhelming success.